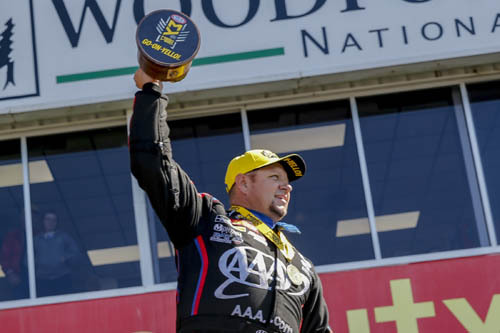 BAYTOWN, Texas - John Force Racing made a statement this weekend at the 32nd annual Mopar Express Lane NHRA SpringNationals presented by Pennzoil when it claimed both nitro category victories with Brittany Force winning in Top Fuel and Robert Hight winning in Funny Car on Sunday at Houston Raceway powered by Pennzoil. 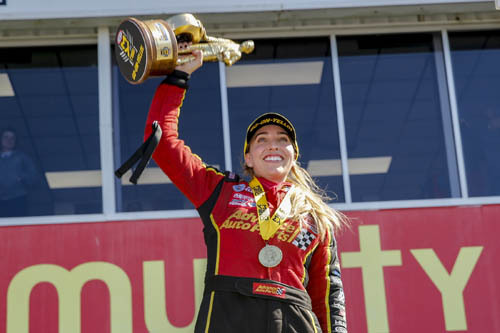 Brittany Force celebrates her ninth win. "All of John Force Racing was on a mission this morning," B. Force said. "My dad and I were No. 1, the first time father and daughter have ever qualified No. 1 at an event. That's something very special my dad and I will share. We were looking for a win but to be able to do it with Robert Hight by my side in that Auto Club car, that's pretty awesome." 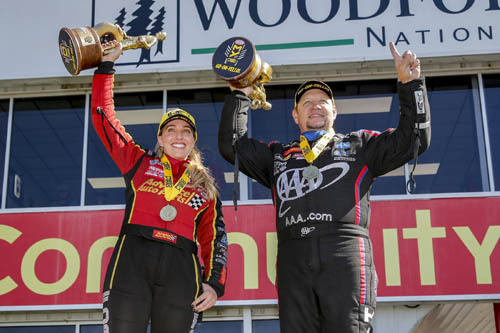 Robert Hight celebrates third Wally this year. "I'm proud of [my team], never disbelieved in them," Hight said. "That's why we have three wins already this season because they're so good. Down at the other end, they said, 'How do you keep your team in check?' Really, it's the other way around. They keep me in check. I've never seen a more focused group of individuals. They keep their heads down, work hard, don't do a lot of talking and we got the job done. "Brittany and I, this is the third time we've got to double-up. We seem to do really well together in these circumstances. It was really cool to be down there when she made the [turn off] and throw a bunch of Mello Yello on her car." Top Fuel -- Brittany Force, 3.749 seconds, 302.14 mph def. Antron Brown, 3.995 seconds, 233.48 mph. Funny Car -- Robert Hight, Chevy Camaro, 3.941, 310.84 def. Matt Hagan, Dodge Charger, 3.966, 311.70.